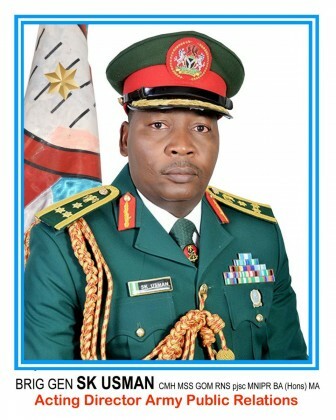 The Nigerian Army wishes to inform the public that due to the ongoing final clearance and occupation of Boko Haram terrorists hideouts in Sambisa forest, quite a number of them are escaping the theatre of operation in the North East to various parts of the country and elsewhere. Therefore, members of the public especially residents of Adamawa, Borno and Yobe States, are hereby requested to be extra vigilant, security conscious of strange movements or persons in the society. The citizens are also please requested to report any suspicious person or group of persons to the security agencies for prompt action. We wish to reiterate our commitment of clearing the remnants of the Boko Haram terrorists in all their suspected hideouts by the end of this year. We therefore solicit for more public support and cooperation to achieve that. The Nigerian Army should declare a state of emergency and restrict movement to track and neutralize these boko aramists.